One of the first things we bought when setting up my wife’s law practice was a Fujitsu ScanSnap. When my wife first told me she needed a ScanSnap, I responded that we had a scanner – you know the kind, one of those free printer-scanner-copiers you can get when buying a Mac (both the Apple Store and MacMall frequently offer this promotion). I was then informed that preparing an estate plan requires lots of scanning – to the tune of a few dozen of pages for each estate plan. A flatbed scanner clearly wasn’t going to be sufficient, so we got a Fujitsu ScanSnap S510M. MacWorld posted a review of the Fujitsu ScanSnap S510M over the weekend. Our experience with the S510M has been generally positive, but it hasn’t worked as well for us as it did for the MacWorld reviewers. When the S510M first arrived, I was pretty amazed. The scanner was fast, pretty easy to use, and came with a copy of Adobe Acrobat. There have been a few frustrations, though. The MacWorld review states that the S510M is “much less prone to sending through multiple sheets at a time.” I don’t know how well the earlier ScanSnap models performed, but the S510M could still use some improvement. Pages that were stapled, paper-clipped, or three-hole-punched will sometimes go through the scanner together. Fixing the problem usually involves either several tries or carefully feeding the sheets in one at a time. Overall, we’re happy with our ScanSnap S510M. Even with the sheeting feeding problem, using a ScanSnap is still much faster than using a flatbed scanner. Save on a Scan Snap: Through the end of the day today, MacMall is offering the ScanSnap S510M at only $390 after a mail-in rebate. I wish that promotion had been going on when we bought ours. If you miss the special, the regular (non-rebate) price of $440 is still a pretty good deal. After a little bit of a lull, I have been buying more software recently. The reasons why, I think, is that many of the websites have used screencasts to promote their software. Screencasts make for a much more compelling sales presentation. I probably would have looked right past OmniFocus if it hadn’t been for a very long screencast The Omni Group posted to their website. Screenshots and feature lists simply can’t capture the subtle interface details of many great programs. Another such program, and the reason for this post, is 1Password. I took another look at it because of a post by Aaron Pelley over at his Criminal Defense Law with an Apple blog. I purchased a family license for 1Password today, and it was all thanks to the screencast on the 1Password website. I actually looked at 1Password a while ago when I was searching for an encrypted data manager. I wasn’t that interested in 1Password because it looked like a simple browser plugin that just upgraded the built-in auto-complete and password memory features. As the screencasts demonstrate quite well, 1Password is much more than that. I ended up purchasing Data Guardian. I am quite happy with it, but it isn’t very well integrated with the browsers. As it happens, I am still glad I purchased Data Guardian because it is a great place to store credit card numbers, email passwords, and software license codes. If my experience is representative, we will probably start seeing more and more screencasts as smart software publishers take advantage of a great way to market sophisticated software. I am a little surprised, though, that people aren’t picking up on this trend faster. I spend a lot of time trying to stay abreast of all the latest developments in the Macintosh community. New software or hardware, reviews, apple rumors – I want to know it all. To accomplish that, I have a fairly long list of websites that I visit. Most of the sites I only visit occasionally – maybe two or three times a week. Others I visit like clockwork every single day (some even repeatedly throughout the day). MacInTouch: MacInTouch helps me keep my software up-to-date. Almost every day, MacInTouch posts links to new product announcements, new versions, and beta versions for Macintosh software. MacNN: MacNN has news and reviews for Macintosh users. MacNN is listed second because Macintouch is often the first site that I visit in the morning. I visit MacNN several times a day, though – I like to stay on top of Macintosh news. The Unofficial Apple Weblog (TUAW): TUAW is – as its name suggests – structured more like a blog. The articles tend to be a grab-bag of product announcements, new product versions, tips, reviews, and other news. TUAW doesn’t cover everything – that’s not the point. They cover things that are interesting – to them – and hopefully to you as well. MacSurfer’s Headline News: MacSurfer’s has links to news articles on all the major mainstream media and tech news sites that involve either Apple (the company) or Apple products. It can get a bit repetitive at times because when something major happens every news site writes about it. It’s pretty comprehensive, though. So, if you don’t mind sifting through a long list of news items, MacSurfer’s can be a pretty good resource. Rumor sites: MacRumors and AppleInsider. Until very recently, Thinksecret was on this list. But, now only two remain. There are many other Apple rumor sites, but I see MacRumors and Apple Insider as the most reliable. Usually, any reliable rumor that shows up on another site makes its way to one or both of these pretty quickly. What Mac websites do you visit every day? Is there anything that should be on my list, but isn’t? 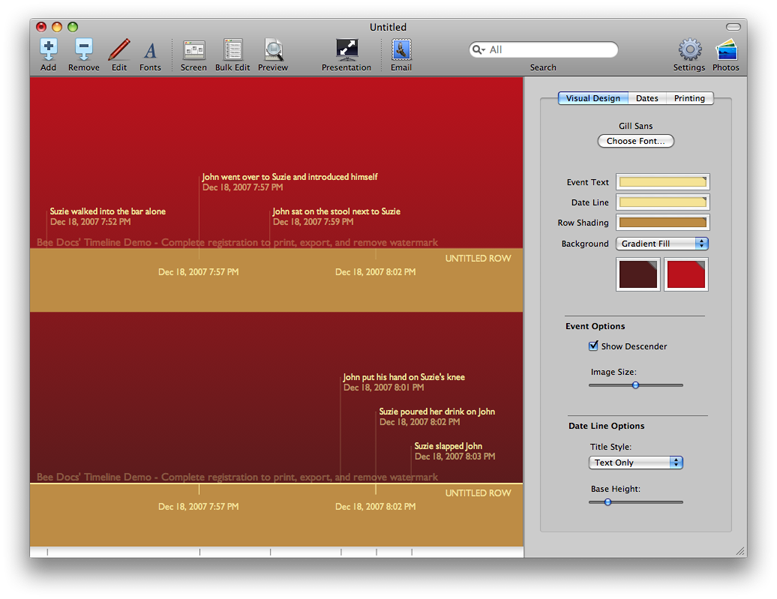 Bee Docs recently released the second version of Timeline, their chart creation program for Mac OS X. When I first saw the announcement, I thought “that is going to be a great tool for litigators.” Almost any type of litigation has some kind of timeline worth showing. And from the samples on the Bee Docs website, it looks like Timeline can create some beautiful timelines. But, as Lee Corso would say, “not so fast, my friend.” I tried out Timeline today and it seems like it is almost there. To start with, Timeline is very easy to use. After choosing a theme, you can begin adding events to your timeline right away. Timeline does sport some iLife integration (Address Book, iCal, iPhoto, and iTunes), but these options all seem more like fun things to play around with at home, rather than useful business tools. As you add entries to your timeline, the scale automatically shrinks or expands to accommodate your entries (more on that later). Timeline has many appearance options. The default color settings can be modified. Pictures can also be added, either as a background image or as labels for your timeline entries. And, as you would expect, the font used for your timeline can also be changed. Timeline is still a little rough around the edges, though. Often while creating the timeline, I wished that I could manually change things that Timeline does for me. I want to change the span of the timeline, but I can’t. That feature would be particularly helpful when two timelines are being created on the same page (see the screenshots for an example). Ideally, I would like the second row to pick up at the spot where the first row ended. Timeline, though, seems to require both rows to have the same timespan. There are other little annoyances. New events are added in a small popup window. The window can’t be moved, though, and any attempt to do so simply adds an event with whatever data you had entered when you tried to move it. I would also like to be able to manually place the event titles vertically. I like the fact that Timeline can handle all the layout so I don’t have to. But, I would also like the option of moving things around a bit to create the exact visual impact I am looking for. I am really hoping for a Timeline version 2.1. 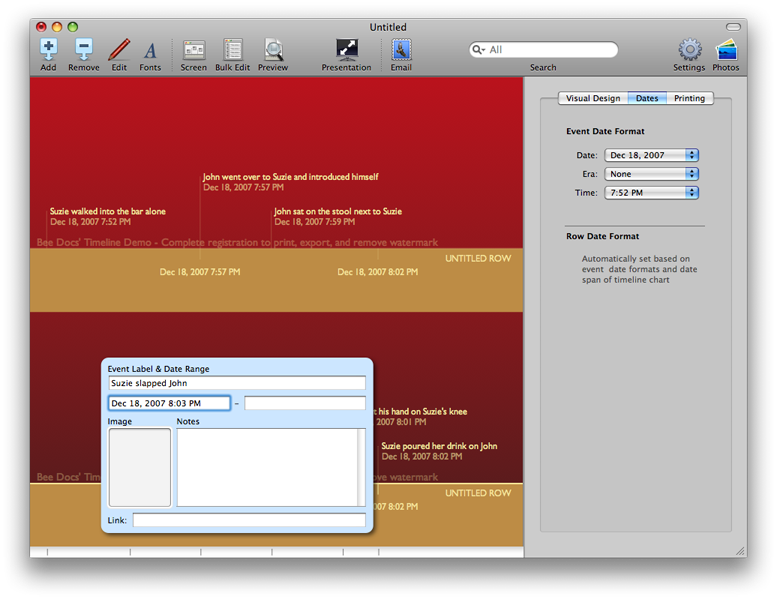 I think with just a few more tweaks and features, Timeline could be a program really worth using. After four years of using only a laptop, I finally decided to buy a desktop. Yesterday I took advantage of the holiday sale going on right now at MacMall. In typical Apple fashion, the top-line price being offered isn’t that great ($5 off Apple retail). But, the combination of freebies (a printer and Parallels Desktop) and rebates made it a compelling offer. I chose the 2.4 Ghz / 1GB / 320GB, 20″ iMac. I would love to have the larger screen. It just seems smarter, though, to save the money and buy a second monitor sometime later (the cost to upgrade from a 20″ to a 24″ screen is almost half the cost of a 20″ cinema display). I still haven’t gotten a shipment notification yet, but I am hopeful that my shiny new toy will arrive in time for Christmas. Of course, by “toy” I mean my “powerful, serious, work computer.” I’ll try to have some fun with it for a few days, though, just to set the right tone. Update: I got my shipment notification. No word yet on when they are likely to be delivered. It being the week before Christmas, anything is possible. Update 2: It’s here! I am actually a little surprised it arrived before Christmas. Unfortunately, I am so busy with work that I might not get a chance to open the box before Christmas (and maybe I shouldn’t try – just for the sake of nostalgia).